While the SFU softball team was able to get their first win of the season, their struggles continued overall when they hosted Northwest Nazarene for a four-game series over two days. Going 1–3 in the series, the Clan now drop to 1–11 in the GNAC so far this season. Game one was tight, but SFU faced a great pitcher in Jordan Adams from NNU. She pitched all seven innings, giving up only two earned runs and striking out five. 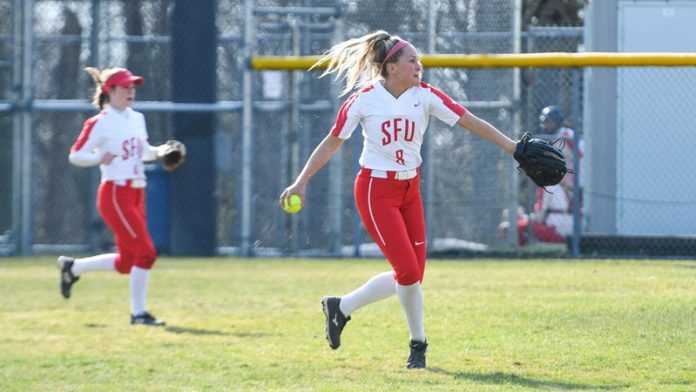 Right fielder Kate Fergusson hit an inside-the-park homerun to lead-off the Clan in the first inning, and catcher Amanda Janes drove in another run for SFU late, but the team eventually lost 3–2 as they were unable to score a run in the bottom of the seventh. The most exciting game for the Clan so far this season, the team finally got its first GNAC win behind a huge performance from Janes. After falling behind by three runs in the second inning, SFU came back with five runs of their own. After heading into the seventh and final inning tied 5–5, Janes stepped up to the plate. She delivered with a walk-off home run, which may mark a turning point in the GNAC season for the Clan. The team won 7–5, with pitcher Anissa Zacharczuk picking up the win. After a great win to end Friday’s set of games, SFU could not get anything going against NNU in the first game on Saturday. The Clan went down 7–0 by the fourth inning, and while they were able to pick it up a bit, the deficit proved to be too much for the home team. Janes homered again, hitting a two-run home run in the fourth inning, giving her six dingers on the season. Fergusson drove in the third and final run for SFU with a single in the fifth inning. Eventually, SFU lost 7–3. The final game of the series was closer, but the Clan were unable to keep up with the Nighthawks offense once again. A five-run sixth inning for NNU was the difference in the game, started by a two-run home run by Nighthawks first baseman Kylie Orr. While the Clan came up with four runs in the sixth and seventh innings combined, they eventually lost 7–5. With the series loss, the Clan are now 1–11 in the GNAC so far this season. This record is not quite representative of the team’s season, however, as they have gone 5–1 in games outside of their conference. The team will host Western Washington University for two games on Monday before travelling to California to compete in the Tournament of Champions next weekend. Monday’s first game begins at 2 p.m. at Beedie Field in Burnaby.